One of the first steps most organizations take when improving their business security posture is enabling Multi-Factor Authentication (MFA) throughout all of their networks and systems. MFA, also commonly known as 2FA (“2-Factor Authentication”), provides businesses with a variety of improved security benefits including significantly stronger encryption of user login credentials, intrusion detection, and enhanced fraud protection. Despite the many benefits of MFA, many companies still struggle to adopt it as part of their cybersecurity plan. 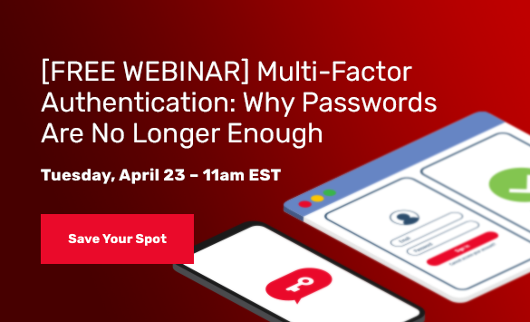 Here are three of the most common reservations about adopting multi-factor authentication -- and how you can overcome them. When managing login credentials for multiple systems, most people have a go-to list of usernames and passwords they regularly use for easy recollection. The problem with this, however, is that while it may be a convenient way to remember passwords, it’s also unsafe. Multi-factor authentication adds additional security layers to user login credentials by requiring a secondary form of identification before granting access. While MFA provides additional security protection, many people reason that these additional steps to grant access are inconvenient and hard to use. However, there are many third-party applications available that make managing MFA protocols easy for both employers and their employees. Besides the benefit of ensuring your business stays protected, mobile authenticator apps and password managers make it easy for users to access areas of their system while never forgetting their login credentials. Multi-factor authentication seems like it’s a complicated process which is why some companies choose not to embrace it. However, two-factor authentication doesn’t have to be difficult to integrate or configure. In fact, most websites, email clients, and cloud-based services have already built in this functionality, making it easy for businesses to add additional security layers and login protection. Many MFA integrations can be up and running the same day and rarely require a lot of technical expertise to configure. For larger organizations with multiple security layers, working with a managed service provider is a great way to establish consistency of MFA protocols across various systems and networks. Third-party providers can also help keep your business productive by prioritizing and executing your business security initiatives while allowing your business to focus on other mission-critical areas. Another common roadblock for companies looking at 2FA/MFA integration is the cost to deploy. Depending on the organization, some MFA solutions can require multiple investments in specialized hardware and security keys in order to manage the authentication processes. This doesn’t even consider the costs of having to dedicate internal resources to the administration of all user accounts and security tokens. A great way around this is by using a SaaS (Software as a Service) MFA solution to reduce the cost of ownership. SaaS MFA providers take the hassle out of creating an in-house MFA solution and allow companies to deploy two-factor authentication across all of their IT resources in one place. And because these services only make you pay for the number of users you actively protect, you’re able to save significant upfront investments in your business security while making it easy to scale your solution as your needs change. Multi-factor authentication is a great step forward in securing your business security. By overcoming initial reservations in MFA setup and costs, you can enjoy the added layers of security while utilizing cost-effective services to manage it efficiently.